Calgary Tourism is known to White Hat pretty much anyone who comes through town, as they should because it makes people feel important and then they embrace the city...but don't tell them that. We want them to think they are extra special. Anyways, for the Stampede they are 'White Hatting' 40 prominent Canadians with a special edition hat by Canadian designer Paul Hardy. For some reason they forgot me on their list...jerks. Just kidding...clearly I am not that important. I mean, Ben Mulroney has made better contributions to the world than I have right...? Steve Nash. He made it into a Nelly Furtado song, and he is like, really good at basketball (say that in the tone of Snooki). Don Cherry. Cherry is the man. If he told me it was a good idea to kick a random stranger in the face I would do it. That's how awesome he is. 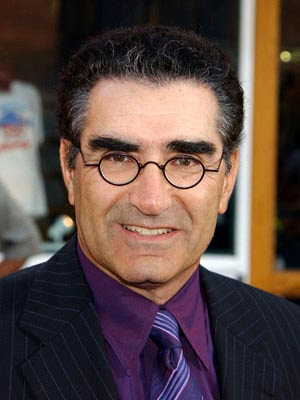 Eugene Levy. I think we all know how I feel about the Levy family. Canadian Royalty...of epic proportions. Michael Buble. We would be married right now if it wasn't for that Argentinian hussy. Hate her. Joannie Rochette. Remember her? Her mom passed away during the Olympics before she was going to Skate...and she still came in third. Inspiration, no other word. For a full list of the people Calgary keeps giving things to for doing little of nothing click here. The Globe and Mail is also doing a contest for people who go onto the website and submit their memories/experiences of the recipients...if you enter you could win one of the hats. Does this mean you will be officially 'White Hatted'...let's not get carried away. You are still no one, as am I. Five of the 40 will be at the Stampede to receive their White Hats on the 10th of July. Please let it be Eugene Levy....PLEASE GOD PLEASE. Thanks.